Built on a full 4 acre block, and replacing his earlier mansion, "The Terrace," Four Acres was Benjamin Duke's chateau-esque estate in the core of Durham. 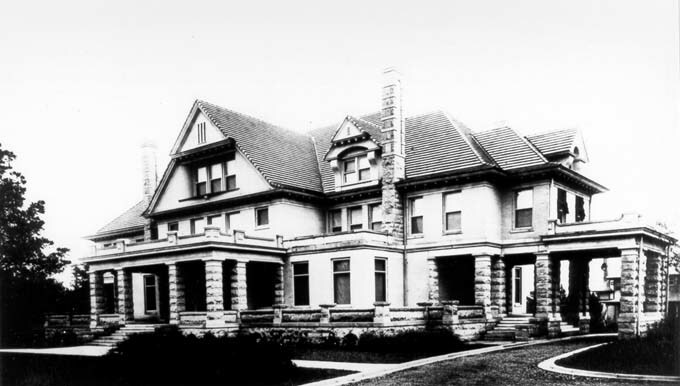 After Duke's death in 1929, the house became an event venue / alumni house for Duke University, until they cast it aside in the 1960s. It was demolished in 1961 and replaced with the NC Mutual tower. I'd rather see the house than that monstrous ugly concrete pile. Unbelieveable that Duke would sell off it's heritage. It's shameful that someone can be so ignorant that they can't see that a wealty person also created thousands of jobs and as a result of their success gave families and communities the ability to build a comfortable life and a vibrant community. What was the alternative? Tents and squalor? Yes the Dukes were rich, they gave a lot of it away too. I was given the opportunity to walk the halls of Four Acres before it was torn down. I was just a teenager at the time but after the visit on that Sunday afternoon it made my heart ache knowing that in a few days the house would be no more. Only photos in books of what Durham used to be. I think that was most likely the beginning of my love for old homes, I understand that every house can't be saved, but Four Acres was a major part of Durham's history and should have been saved. I agree with you and even said so during my tour of the site "Why can't we make it a museum?". The city of Durham and Duke (I believe Duke owned Four Acres at the time) let a part of our heritage go. I pass that corner every Friday and memories of the walk that day still haunt me. My father bought a pair of the huge stable/garage doors and the tracks they hung from. He installed them on a lrage shop he built behind our home, so that he would have an opening large enough to pull out the cabin cruiser boat he built. he also bought massive floor beams from the house which he had split at West Durham lumber for use as the rafters in the shop. I will find and upload a picture of the stable doors installed on his shop. I remember going with him into the basement of the house to see those massive wooden floor beams shortly before the dismantling began. I was among the many who saw VP Humphrey come and dedicate the new building. The two carriage house doors my father bought are in this photo I took today 8/23/12. They hang from tracks and roll back and along the inside walls. On one of the color images of the house being demolished (#18 from the top), do I see a couple of stained glass windows propped against the tree in the foreground? Fluent in the history of NC and the Duke's impact on history, I don't blame anyone, but the demolition images do sicken me. As a curiosity, would anyone know where the stone/masonry was dumped? That material, probably still at its repository, would be of interest to someone/someplace. Regarding the Mutual Building, I recall when it was being constructed, it was supposedly the largest "pre-cast" concrete building in the world -- an appellation that I'm sure was overtaken by other buildings soon thereafter. Also, I heard that the building as constructed, was seriously "out of plumb" -- to the degree that there were problems with the operation/installation of elevators originally. I do not know if this is true or not but I did hear it repeated several times back then. Also, as many may likely recall, given the era in which the building was constructed, it was jokingly referred to by some in the white community by a very derisive nick-name that was well-known at the time, but one that I prefer not to repeat here. The nickname reflected, of course, an unpleasant reality of the era. It is disappointing indeed that the house was torn down. I too wish it had been preserved as a museum. From a trusted source I was told there was a large safe in a wall still in the house that had been covered over several times with paint and wallpaper. It was opened by a locksmith while the house was being demolished. He said there were gold bars stacked as high as his head in it. He was over 6 ft. tall. Too bad it wasn't used to preserve the house. Years ago I worked at Duke Homestead. They had a curved brass (gas?) light sconce. Not much to it; just the curved pipe with a slight ornamentation on each end. Just kinda cool to hold and know where it came from and who it might have seen at one time. 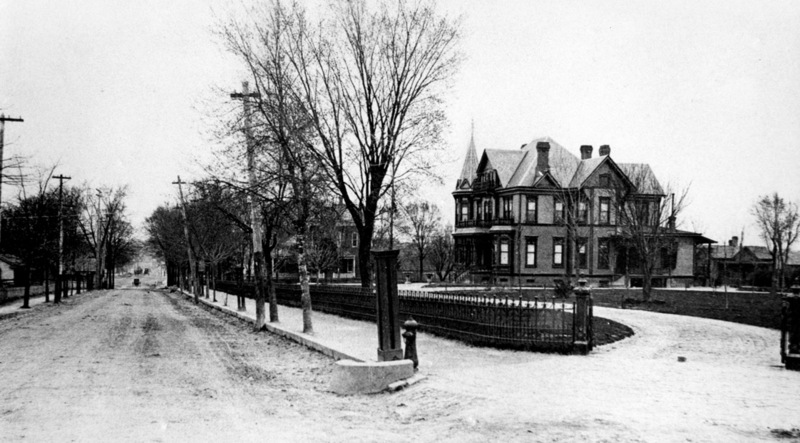 The block bounded by West Chapel Hill Street, Willard Street, Duke Street, and Jackson Street was the location of two different houses of Benjamin N. Duke, brother of James B. Duke and Brodie L. Duke. 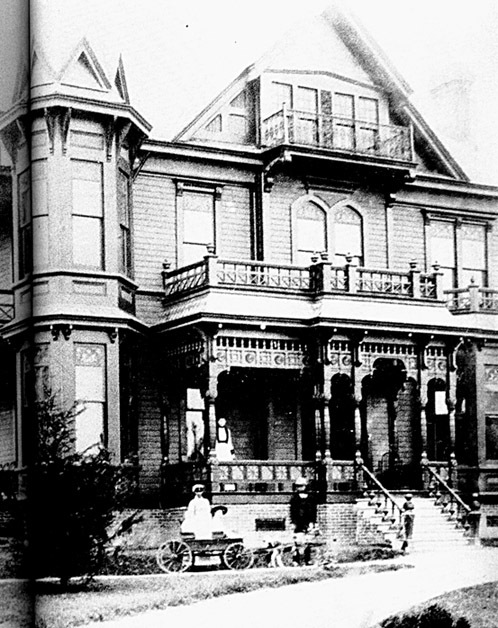 In the 1880s, he constructed 'The Terrace' on this block - a large frame Queen Anne Victorian structure with a tower, as was popular on many contemporaneous structures. After B.N. Duke's death in 1929, the house passed to Duke University, who used the house as a guesthouse and reception area for 30 years. In 1960, the University decided to sell the property and building, and it was demolished soon thereafter for the construction of North Carolina Mutual's new office building.